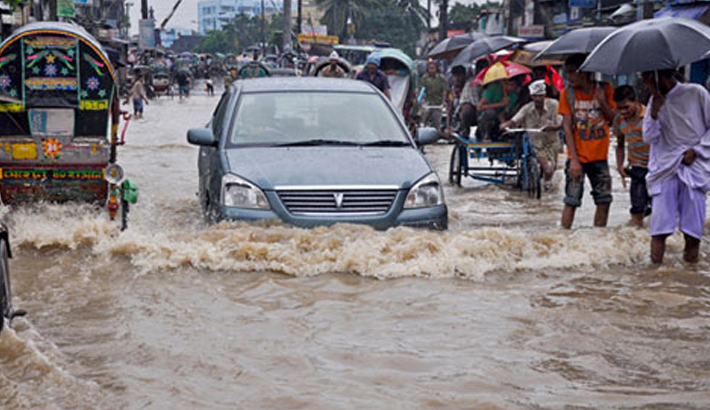 Unplanned urbanisation, faulty drainage systems and embankments surrounding the urban areas are largely responsible for the rain-induced waterlogging in many parts of Dhaka, Chittagong and other urban areas, experts suggest. There was a time when the two big cities used to witness flooding every few years, but indiscriminate waterlogging has now become a regular phenomenon, especially during the rainy season. Megacity Dhaka and port city Chittagong have been experiencing extreme waterlogging issues and even a light rain causes abrupt waterlogging in many parts of the two cities. The two cities have been facing extensive waterlogging, especially, during the monsoon that increased water pollution, traffic congestion, air and noise pollution, solid waste disposal. Inadequate drainage sections, conventional drainage system with low capacity and gravity, natural siltation, absence of inlets and outlets, indefinite drainage outlets, lack of proper maintenance of existing drainage system, and over and above disposal of solid waste into the drains and drainage paths are accounted for the prime causes of blockage in drainage system and waterlogging in Dhaka and Chittagong.Experts said the urbanisation thrust did not leave behind sufficient drainage systems in the cities, leaving parts of the urban areas inundated for days during rainy seasons. “Panthopath box culvert in Dhaka City and Sheikh Mujib Road Culvert at Agrabad in Chittagong have made the crisis even worse,” renowned urban planner Khondoker Neaz Rahman said. He also said the construction of box culverts was totally faulty, some government officials and foreign companies have been benefited by those projects. Box culverts mostly remain clogged as those are not cleaned up regularly, causing water stagnation. Criticising the drainage and sewerage systems in Dhaka and Chittagong, he said though the drainage and sewerage systems are designed in round shape in most countries, in Bangladesh, those are in square shape. “Square shape drainage system gets clogged quickly and becomes useless in a few years,” he said, adding that water sweeps over the drains in the cities during the monsoon. Neaz Rahman also alleged that a certain group has been benefited by the drainage system projects as they made huge money out of used those projects. “We must make the drainage system as per endogenous technology, keep the major drainage channels cleaned, and ensure that the water reseeding points, especially rivers surrounding the cities, are clean,” he said. More than 10 canals in Dhaka city have been filled up entirely or turned into box culverts to construct roads. Roads were constructed in Rayer Bazaar, Raja Bazar, Gopibagh and Shyampur Kadamtala filling up canals. Meanwhile, Segunbagicha canal, Dholai Khal-1, Dholai Khal-2, Debdholai Khal and Paribagh canal have been narrowed down for building box culverts. All the covered water channel remains clogged due to lack of proper maintenance. Rain water can not properly flow through the channel after heavy rain. Construction of box culverts usually results in a gradual reduction of the flow caused by continuous sedimentation for the lack of regular maintenance, said the urban expert. To remove the city’s water-logging problem effectively, its natural drainage system has to be restored. “Only a well-planned drainage system can solve the mega city’s water-logging problem,” Neaz Rahman said.